Perched at a dizzying height above the tiny harbour, Flagstaff Cottage was the focus of many social gatherings enjoyed by artists living in Lamorna in the early years of the twentieth century. Today the house is little changed, and remains the family home of the descendants of Samuel (Lamorna) Birch, the painter who one hundred years ago was instrumental in attracting artists, writers and intellectuals to the valley. A year ago I interviewed Lamorna Birch’s grandson, Adam Kerr, about his grandfather’s friendship with Laura Knight (see separate article). 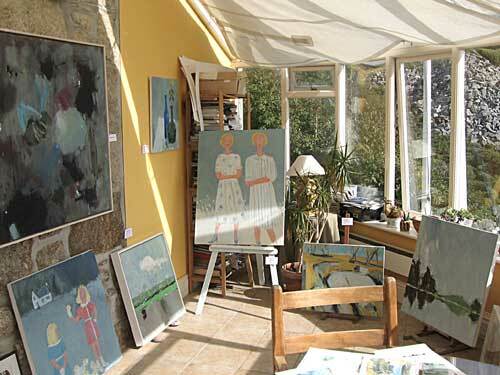 The valley still thrives as an artistic community, and the Lamorna Arts Festival of 2010 was the reason for my return visit. A steep climb up from the harbour car park brought me, puffing and panting, to the sunny front garden, where I was greeted by Adam’s wife, the artist Judith Kerr. 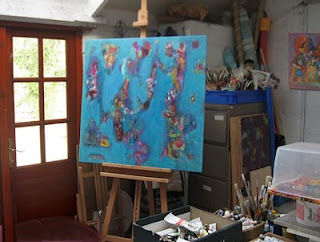 The couple returned to the family home in 1997 after several years abroad, enabling Judith to paint locally. However, it is memories of her early life in Canada, often triggered by the writings of Alice Munro and Margaret Atwood, which inspire her semi-abstract paintings. Judith graduated from Falmouth College of Art in 2005. Steep stone steps lead to her upper studio with dazzling views across the water, where several works in progress are on display. Attached to the house is a larger studio of completed works. 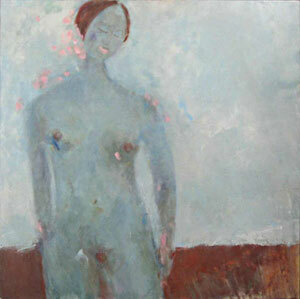 These include a number of figure paintings displaying sensitivity and a lightness of touch, such as Woman’s Weekly Special and my particular favourite, Penchant for Pink. Memories of a childhood in the mountainous border country straddling Turkey, Syria and Iraq are intrinsic to the work of Basma Ashworth, whose early career was that of a scientist. The bright colours worn by the inhabitants of this region prompted her to explore the possibilities of textiles. Courses in design technique and stained glass were followed by a degree in 2005 at Falmouth College of Art. Unafraid to experiment in a variety of media, Basma works with silk and wool, dyeing her own fibres. She also mixes her own paints from natural pigments. This endows her paintings with a vibrancy in which subject matter is subordinate to the manipulation of texture and colour. 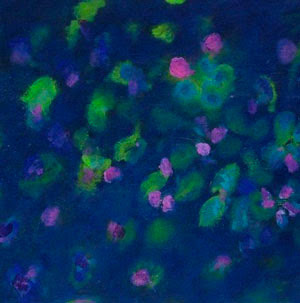 Despite Basma’s assertion that ‘subject is immaterial’, her scientific background does infiltrate her work, for example, the canvas Chemistry is inspired by images of cells viewed through a microscope. On her return from a trip to Syria, which she re-visited after a long absence, Basma painted The Pistachio Fields from memory. These striking images are only two of a wide range of work on view in her delightful studio. 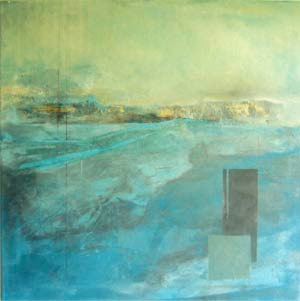 Visit http://www.basma.org.uk/ to see more of this extraordinary artist’s output. Tucked away at the end of a lane is the home and studio of Margret Steigner, who moved to Lamorna from Penzance in 2005. She loves the situation of her studio in relation to the house, so close by that she can work with a focus free from domestic distractions. Margret’s work is inspired by nature in all its aspects, including the microscopic. She has immersed herself in her beautiful surroundings. 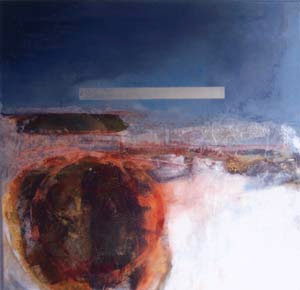 Though she spent the early part of her life in Germany, she seldom travels, having an affinity with Cornwall which reveals itself in her semi-abstract landscapes. She studied photography and graphic design in Germany, and after moving to London in 1989 became a Goldsmiths student . Here Margret felt that the work of female students was often overlooked, but she was fortunate to benefit from the guidance of some exceptional women tutors. Influences on her work include the American minimalist painter Agnes Martin, and Antoni Tapies, a prominent Catalan artist. Margret also admires Warhol for ‘breaking the rules’. Her canvases subtly capture the essence of land, sea and sky. Skyline depicts a scene of tranquillity, while others, such as Portal, evoke nature in more turbulent mood. Margret’s work is on exhibition at the Lighthouse Gallery in Penzance. All three artists I visited work in a contemporary milieu, producing images that reflect their own life experience. The legacy of the original Lamorna community survives in unexpected ways. Next door to Margret’s beautiful wooden home with its white-painted panelled interior – more California than Cornwall – is the house where the controversial artist Hannah Gluckstein (known as Gluck) lived and painted during the 1920s. Within Flagstaff Cottage, beyond Judith Kerr’s exhibition studio, hangs a collection of family paintings. 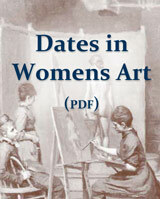 These include a childhood portrait by Laura Knight of Adam Kerr’s late mother, Mornie. Judith herself has painted a touching portrait of Mornie in later life, a manifestation of the continuity of the creative spirit in this remarkable place.